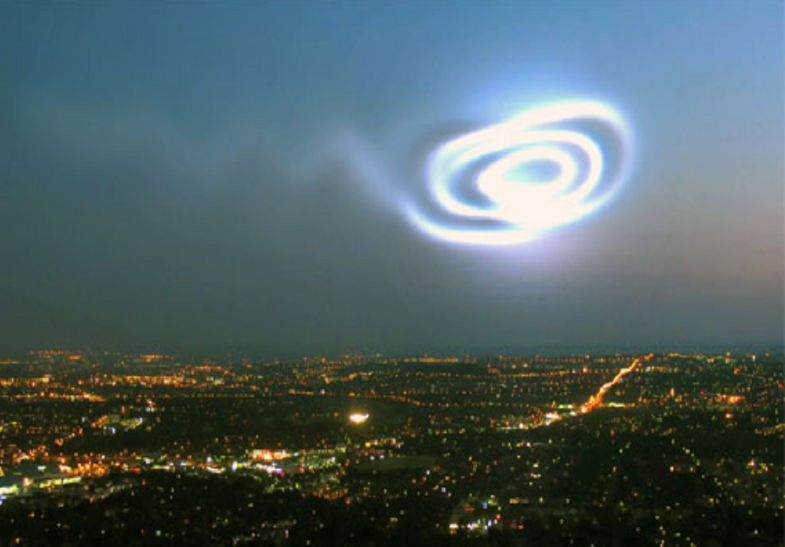 Saturday May 22, 2010 – The Norway spiral comes to mind when TheWeatherSpace.com received photographs and even an amazing video of the event. An object swooped down from the sky and then returned in a brilliant display on Friday night across the Western Canada areas. Three different photographers have given their photos to TheWeatherSpace.com in what looks like something out of a science fiction movie. We cannot see what would cause this one Earth. The Norway spiral was said to be caused by a missile launch in the Russian territory. But what is this? 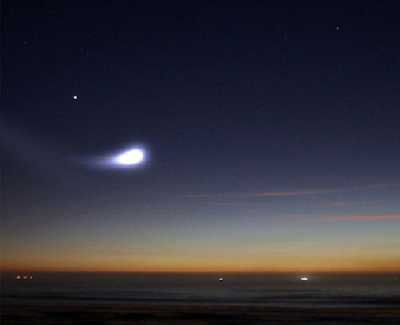 The only known areas to launch on the Western coast are the Vandenberg Air Force Base and Alaskan areas. Vandenberg confirms no launches and Kodiak Island has to be ruled out due to the direction of travel (from the west). The photographs show a very similar shape and mysterious object off the coast of Canada. The object is not a missile as one photograph from the beach has the trajectory curving up! What is it? A video was sent to TheWeatherSpace.com and the web team has added it to the video server on YouTube.com. 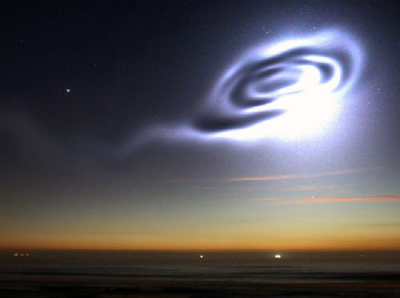 The video shows the entire sequence of this object as filmed by Steven Murray. A new video was just given to TheWeatherSpace.com. The author states that he saw the event and it lasted less than a minute and looked like the object was streaming away at high speed into a tunnel. He saw the article on Coast to Coast AM and had to show us. Monday, 24th May 2010 UPDATE: HOAX! What looked like numerous photographs and videos of a ship entering the cosmos was actually put together by not a team, but one person. Kevin Martin, a Southern California Weatherman has come forward as the hoaxer to what is likely the biggest hoax ever created. Martin claims he e-mailed the material to TheWeatherSpace.com in an effort to test a theory of his out. Martin claims that his theory was correct, Europeans have a better handle on reality than Americans. Upon further investigation it seems like Martin is a master at marketing, graphics, and even manipulation. TheWeatherSpace.com was fooled and I apologize for that. I think its real because if you look real hard at 55 seconds of the video, you will see it do it again in space. This craft went into hyperspace. did you not read the last part from the article? IT WAS A HOAX. This also happened in Norway 2009, Japan and China 2010 did he fake all those photos and videos too? I don&#39;t think so. Read up on http://www.cnet.com/news/obama-talks-spying-with-facebooks-zuckerberg-googles-schmidt/Chris Thomas and you will find out why HAARP is doing this. Or freeze frame it at 57 seconds, you will see the dot. nvm….i heard a boom when i turned the volume way up. it&#39;d be pretty sick if it was real. i just wonder why (if they entered the atmosphere) they would just leave like that. unless it was a fear factor. idk, seems kinda fishy… esp that the camera had such a PERFECT shot of the whole thing. To what you may say. You can hear two booms in the video. You just have to listen. Now that anyone with a $500 computer torrent photoshop or other software, more and more quality fakes are coming to the forefront. It&#39;s a good thing obvious hoaxes like this are easy to spot. It does&#39;nt matter,rather if it&#39;s real or fake. You all know that these things have the capability of doing this feat &amp; more!! Although the video was awesome, I still beleive it was real. I heard the dogs barking in the background and the crickets..Even after the two &quot;BOOMS&quot; the dogs barked even louder. iIt&#39;s still leaves you scratching YOUR heads.. BUT NOT MINE! These videos are fake. yes you can hear a boom , but anone who is good with a computer can make anything seem really. Hello look at what they can do with movies now a days. The video looks really fake but I am sure that there is other life out there. The universe is HUGE. There has to be other life forms. Are they able to do this kind thing with their spaceships? Probably so. I am almost certain that they have better and more skilled technology them us. Who knows. Don&#39;t be close minded.